After a lengthy development process, 3D Realms' female-led Duke Nukem spinoff has landed. Mark drops in for a look. Developers don't try to make bad games. Even the most misguided failures are birthed by teams of designers that probably thought — at least at one time — that they had a good idea. They were excited. They made sketches and planned and coded; they believed in their vision. But if developers don't make bad games on purpose, how then to explain Bombshell? 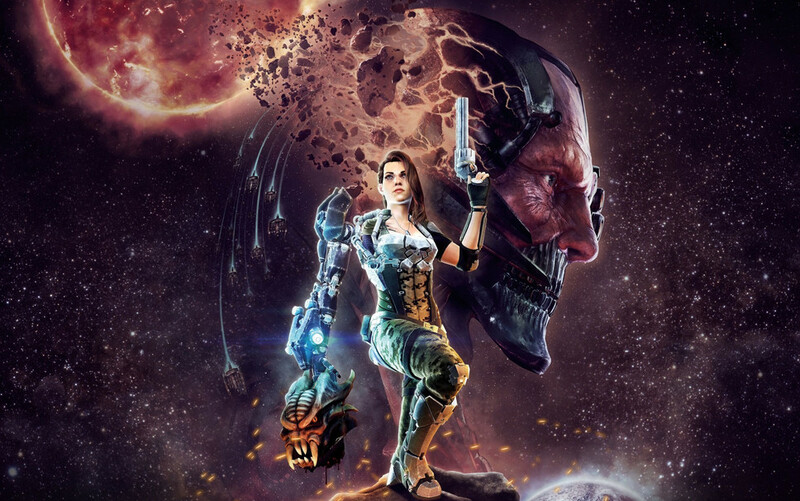 Bombshell is an action RPG from 3D Realms that was supposed to be a Duke Nukem game, once upon a time. Over the course of development — most likely due to litigation and loss of rights — the protagonist became a female Duke knockoff, Shelly "Bombshell" Harrison, voiced with about as much energy and interest as a supermarket checker asking for the price of kale. Duke's legendary misogyny here becomes pallid and frankly halfhearted jokes or references to tampons and PMS. 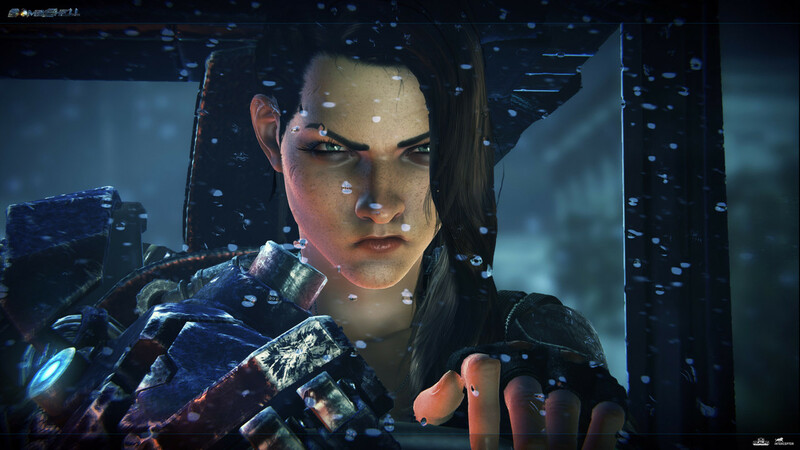 Gamers who expected a seductive femme fatale in Bombshell will be seriously disappointed. The writing and story consist of dull contrivances, terrible one-liners, and an overall feeling of disinterest. Shelly shoots, makes a dud joke, and moves on. The character and her situation make zero impact on our emotions. Few products fail in as many ways as Bombshell. But there are plenty of great action RPGs with unconvincing stories and forgettable characters. Unfortunately, Bombshell fails at both the action and the role-playing, and the less said about its limp and imprecise platforming, the better. 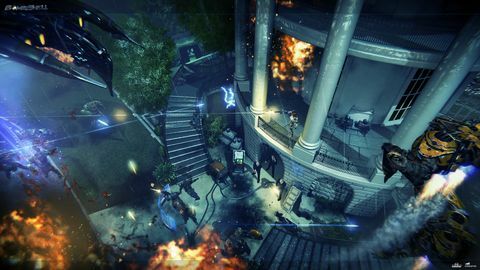 Taking place on three large, elementally-themed alien worlds, Bombshell's combat consists of spraying endless waves of repeating enemies with some sort of ranged futuristic weapon, and occasionally tossing a grenade into the mix. And by "spraying enemies," I mean literally that: just point the squirrelly, hard-to-aim weapons in the general direction of the aliens and let the game fill in the blanks. There are no cover or line of sight mechanics, and alien targeting seems infallible. The alien enemies have no particular biological or thematic connection with the worlds they inhabit, and sport the native intelligence of a bar of soap. 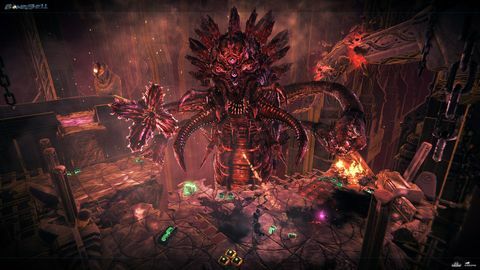 The bosses — multi-stage encounters won by simple attrition and staying out of the line of fire — occasionally even lose interest in the fights themselves. 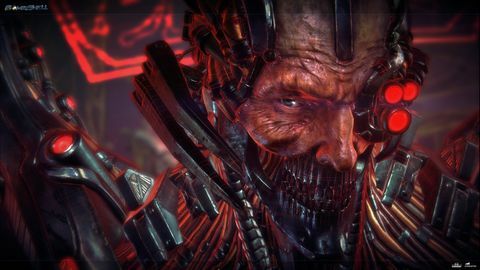 Bombshell is one of those games that adopts the philosophy of “if one enemy is tough, ten will be really tough," but the difficulty actually lies not in crafting winning tactics but simply finding enough space on the narrow paths to fire at enemies without dropping off the edge. Death in Bombshell means losing cash and restarting at an invisible checkpoint (there is no "save anywhere" system), but at least the enemies don't respawn. Thank goodness for small favours. Some of the weapons would be fun to use in a more tactically or environmentally interesting game, but in Bombshell the choice of weapons is relatively meaningless. Whatever gets it over with quickest is the best weapon. The "role playing" part of Bombshell is virtually nonexistent, so players looking for Diablo-like loot discovery, or awesome weapon and armor upgrades, should probably just go play Diablo. Collectibles are limited to ammo and cash; why alien enemies leave little piles of human cash lying around on their ice world is a question that will remain unexplored. Shelly can upgrade her weapons and abilities, but compared to most contemporary ARPGs, Bombshell is one shallow puddle. It's a real shame, too, because there aren't enough action games with strong female leads. When it runs — and with many crash bugs and optimisation issues, that's by no means certain — Bombshell looks decent, with an Unreal Engine-powered gloss to the textures and an interesting palette of supersaturated colours. That's not to say that the level architecture is good. Often, the visuals are overly busy, with too many competing colours and objects to attend to and no clear direction about where to go. There is a minimap — useful for spotting enemies hidden by the camera or scenery — but it doesn't show the quest objectives, necessitating quite a lot of dull backtracking and NPC hunting. Some RPGs take great pains to make sure that the environments and architecture are thematically consistent with the game's lore, that the loot drops make sense, and that there is some feeling of immersion in an imaginative world. Bombshell has some video game levels. Just as developers don't go into a project looking for failure, no critic or player wants a game to disappoint. I think that both developers and players are optimists, wanting every game to be at the very least an enjoyable diversion, and maybe more. Some games are cynical cash-grabs; some are technically or artistically inept in one way or another; but few products fail in as many ways as Bombshell. For a game that was promised to be about a saucy, wisecracking female version of Duke Nukem, Bombshell is dull and broken, and definitely not worth your time or money. Ups Doesn’t look terrible. Some good weapons and cutscenes. Ludicrous and campy story. A female protagonist. Downs Tons of bugs. Brain-dead enemies. Convoluted and confusing levels. Bad platforming. Horrible writing and jokes that are simply an embarrassment to everyone involved.